Heat oven to 350°F (325°F for dark or nonstick pan). Grease or spray bottom and sides of 13x9-inch pan. Reserve 1 cup dry cake mix for filling. In large bowl, beat remaining cake mix, the butter and 1 egg with electric mixer on low speed just until dough forms. Press in bottom of pan. In large bowl, beat sugar, cream cheese and vanilla with electric mixer on medium speed until smooth. Beat in remaining 2 eggs, the sour cream and 1/4 cup of the whipping cream on low speed until smooth; reserve 1 cup cream cheese mixture. Pour remaining cream cheese mixture over crust. In same bowl, beat reserved 1 cup cake mix, reserved 1 cup cream cheese mixture and remaining 1/2 cup whipping cream on low speed until smooth. Drop chocolate cream cheese mixture by spoonfuls over cream cheese mixture in pan. Cut chocolate mixture through plain mixture with knife in S-shaped curves in one continuous motion. Turn pan one-quarter turn, and repeat for marbled design. Tap bottom of pan sharply on counter to level cream cheese mixtures. Bake 32 to 40 minutes or until sharp knife inserted 1 inch from side of pan comes out clean (center will not be set). Cool 30 minutes on cooling rack. Refrigerate 30 minutes. Run knife around sides of pan to loosen cheesecake. Refrigerate at least 4 hours until chilled. Store covered in refrigerator. Cheesecake cutting can be a breeze! Use a wet knife, and wipe it off after each cut for clean, even slices. 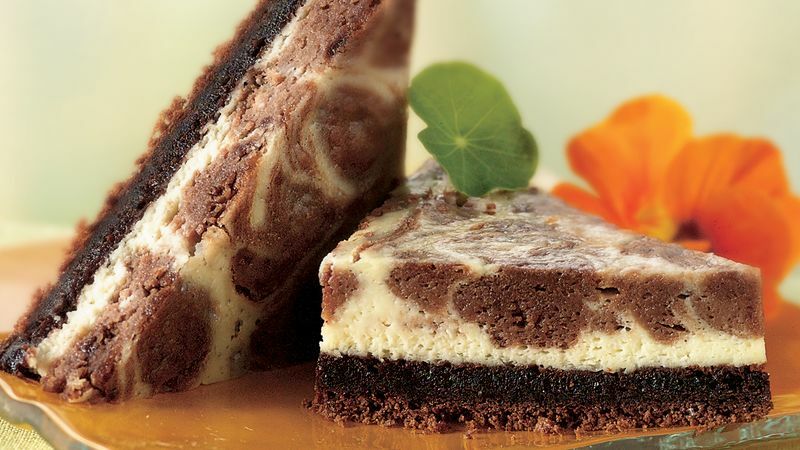 For Chocolate Chip Marble Cheesecake, stir 1/4 cup miniature semisweet chocolate chips into the cream cheese mixture that is left after reserving 1 cup in step 3. For a fun way to serve this easy dessert, cut the cheesecake into triangles. To make triangles, cut cheesecake into 5 rows by 3 rows, then cut each square diagonally in half to form triangles. Place 2 halves on each individual serving plate. Garnish with edible flowers or fresh berries.